Now let’s go inside the house in Birmingham. You know the one that is on the cover of Southern Living this month! Go back here and read if you are wondering what this is all about. I so wish I had taken my good camera, but iphone shots are better than none right? Next time I go to the Cain’s home I will get better shots for sure! Ok let’s start back at entry. 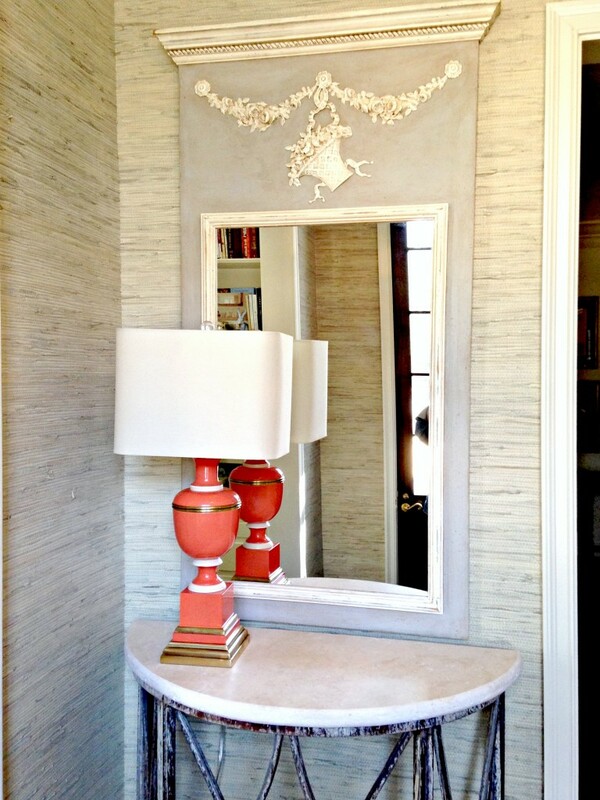 I adore this beautiful mirror, the grasscloth paper and of course that amazing lamp. While I was there, Ragan and I found a great faded blue and white bowl for beside the lamp. 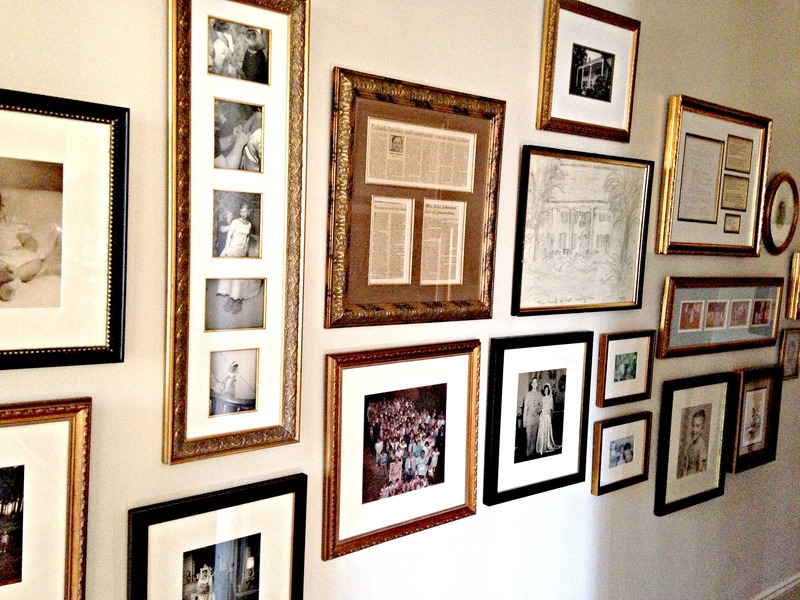 Past the entry and down the hall, Ragan did an amazing gallery wall mostly of her wedding day and her parent’s wedding day. They both had their wedding reception at her Grandparent’s home in Eufaula, AL, her hometown. 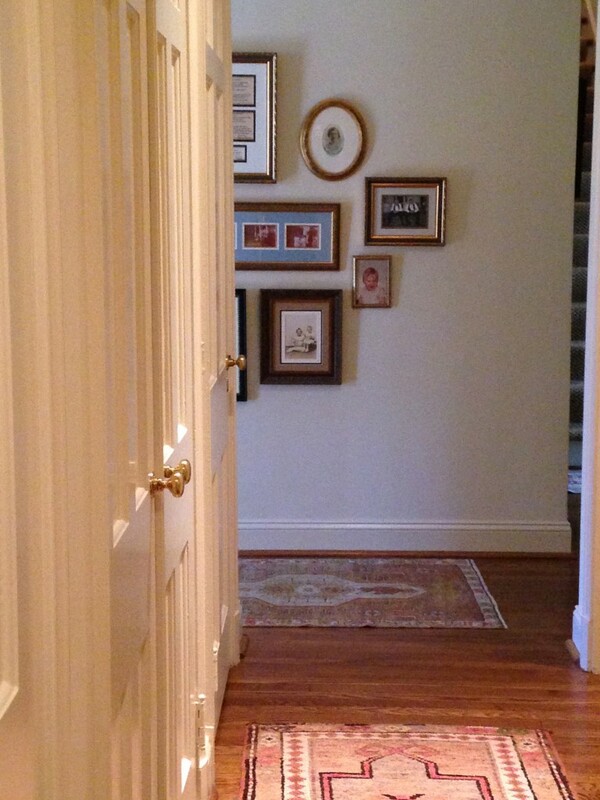 Rugs in every hallway, they don’t “match” but they flow and add so much soul. 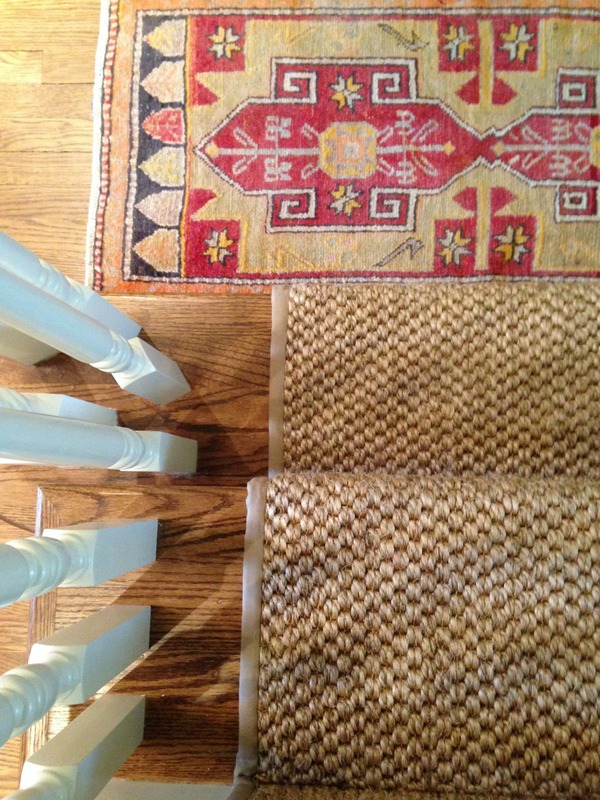 I could write an entire post about Ragan’s rugs and layering of rugs and mix of rugs. She had natural on the stairs and as a base on both living areas with old persians layered on top…And she has old persians in every hall and nook and cranny..i love the mix and the COLOR…even a small one here at the base of the stairs. You can see this one peeking out below her coffeetable/ottoman in living room! She also has books everywhere which I love! And her majolica, oh the majolica collection. But lest you think it’s “old lady” she also has some ghost pieces and Jonathan Adler pillows and Chiang Mai dragon here and there to lighten it up. Its a mix of traditional with a bit of funky and young sprinkled in… just look at the downstairs powder, def “new trad” in my opinion. And I love it. I was so inspired. 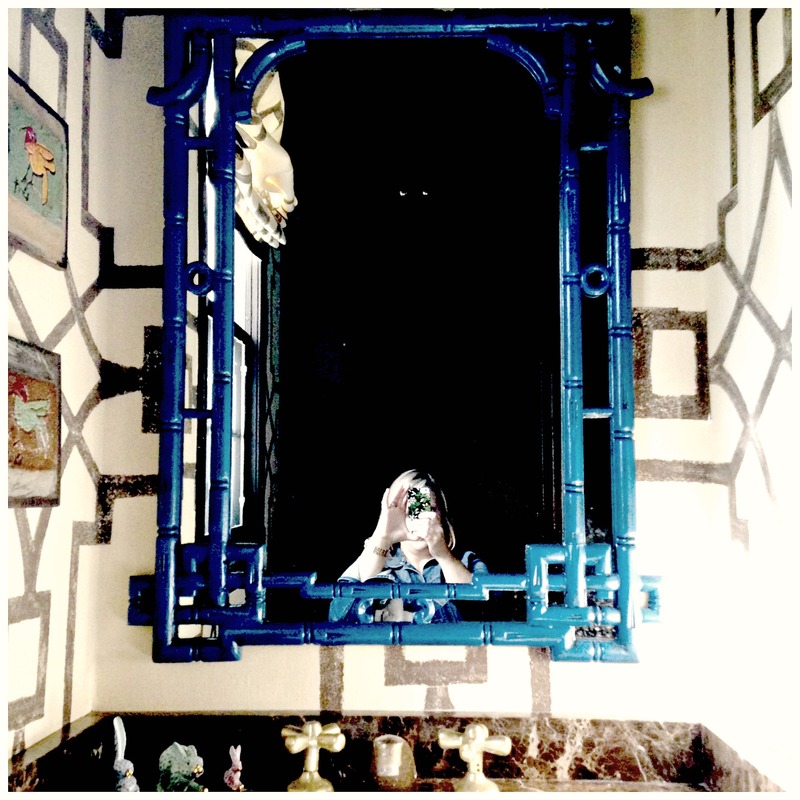 Look at the floor in this powder, and the mirror over the vanity is a rich blue, not navy but not peacock, but def a fun pop of color! 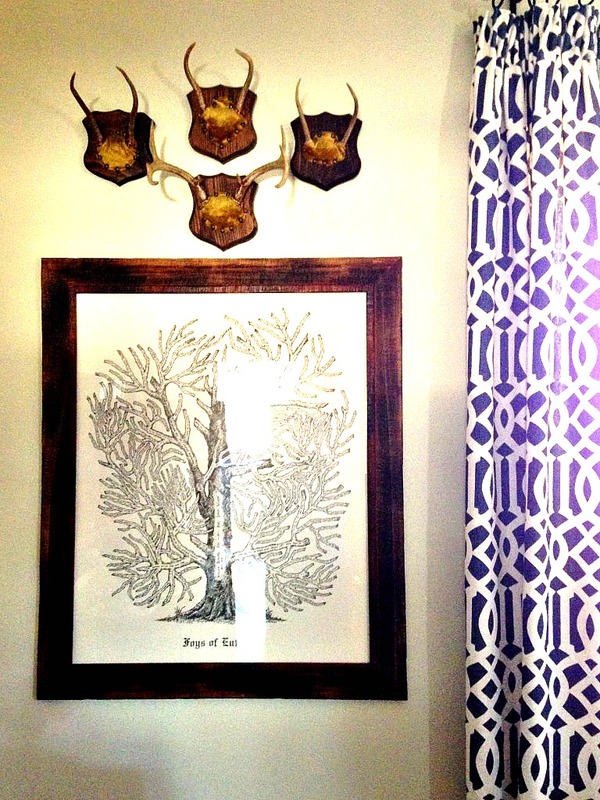 A local Birmingham designer did help Ragan with this space. Notice little rug. Yep that is me getting the shot for YOU. And I think the mirror is not quiet that shade of blue but it is bold and very cool. And trust me I asked and discussed with Ragan before I took pictures of every room in her home. Look more unlacquered brass and some trinkets. I don’t know what these are called but Ragan collects them. And in case you are wondering how she can have little things like this sitting about, well there are no littles YET but hopefully soon. Until then its Judge and Gypsy the dogs. Okay here is the kitchen. I love that is small and in keeping with the 1930s integrity of the home. They could have torn down walls and done a mega kitchen but they didn’t and it’s great. I only got this one tight shot..it has stove on left and fridge on right. And pantry and more storage and cabinets in laundry/butler area. Soft gray cabinets, marble counters, THAT RUG, and then stainless backsplash to give it a bit urban edge. PERFECT COMBO. Ragan’s husband Brad found much of the unlacquered brass on Ebay! Next to the kitchen in close proximity is the utility space, really an extension of the kitchen but a separate room. 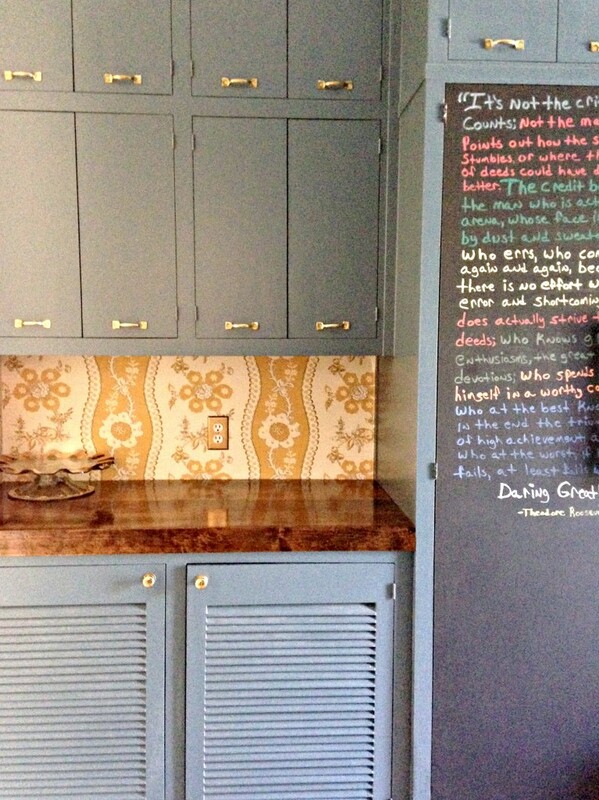 True to the house and how things were built then…its a fab laundry room and butler pantry combo..a great work space full of storage and the most amazing color cabinets and WALLPAPER. 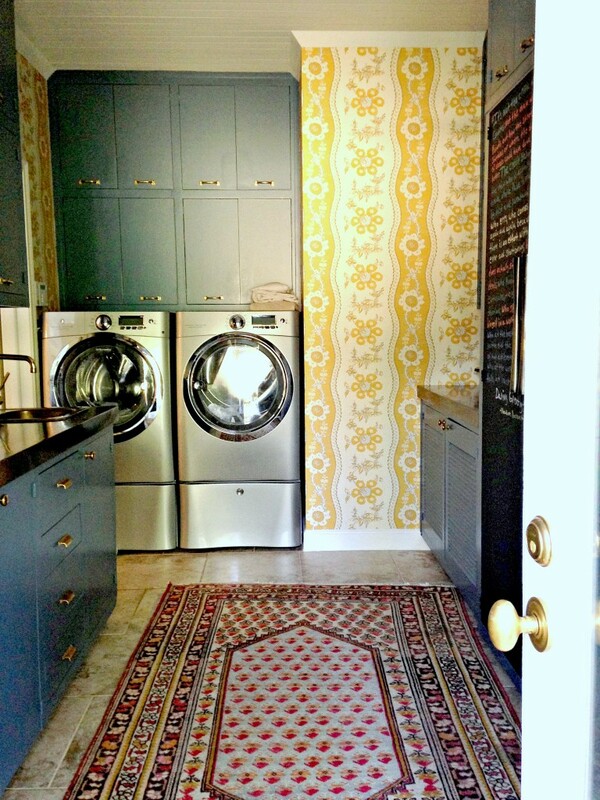 All of the walls and trim in the home are white dove except for the wallpapered laundry room and entry in grasscloth. We are about to paper two bathrooms, one is already swathed in linen. So this room THESE CABINETS, JUST LOOK! How about that Brene Brown/Teddy R quote on the pantry door!? AND THAT RUG! and the ceilings. And the paper. Ragan had help from a local designer choosing wallpaper in the laundry, dining and one bath, the rest of the house she has pretty much done on her own. And all of the walls are a creamy white. Notice the rugs, and I like the horns and the family tree. 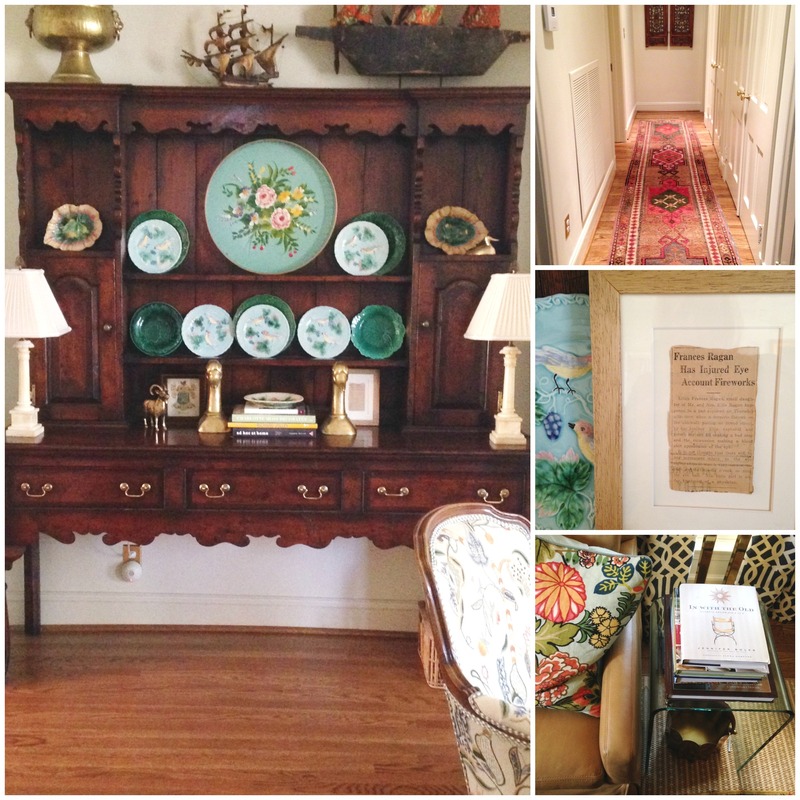 The love of family and history is so evident in this home. It’s one of the things that makes it so Southern I think, the family trees, photos and even family crests. But mixed with so much color and the Schumacher fabrics it stays young and fresh. Notice her stacks of design books. She may be an accountant by day and she has worked with other designers and now me but make no mistake, this Ragan Cain is quite the decorator! She def inspires me! I mean just look below. This is the wall beside the bar. 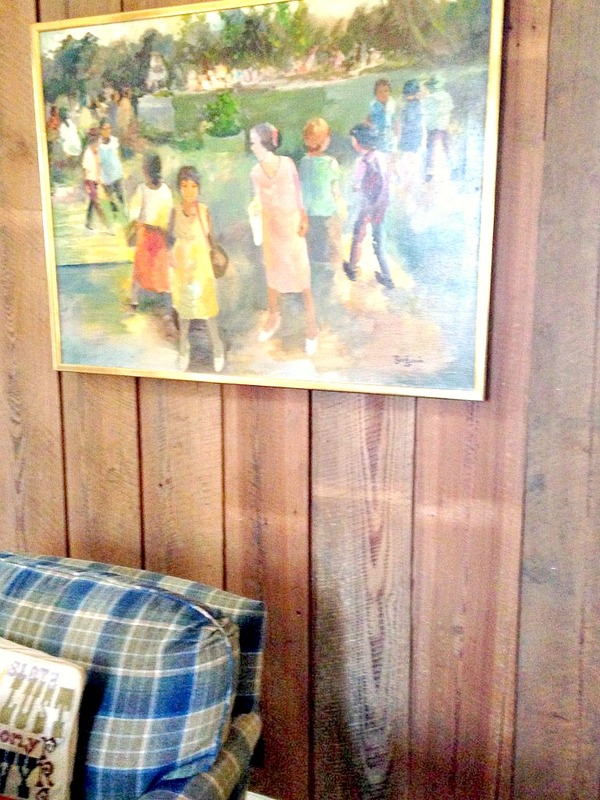 And the other wall in this den looking out to more formal living area. 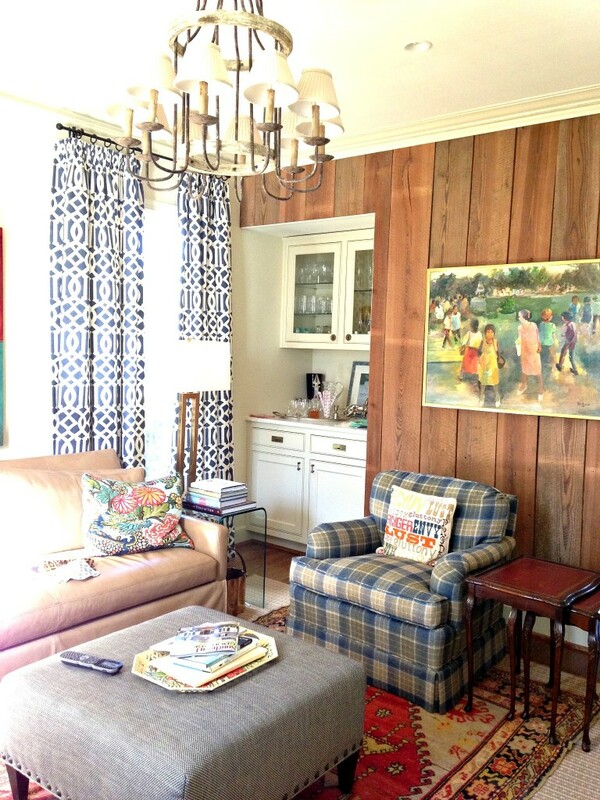 The blue sideboard is from Scott’s in Atlanta. 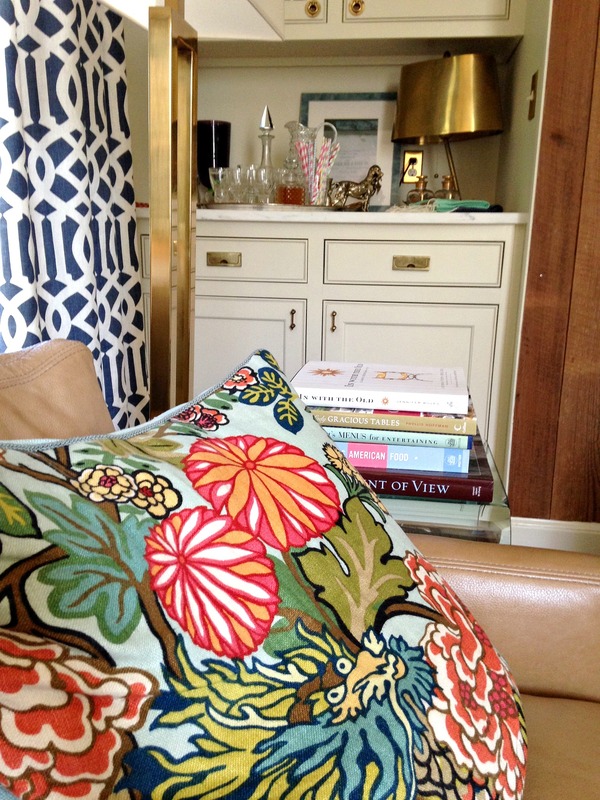 I love Ragan’s pops of color, notice the frame and the shade on lamp by stairs. So good. This is the view from front back toward kitchen sitting room area. From the kitchen looking that direction…showing all angles here because I love this space. 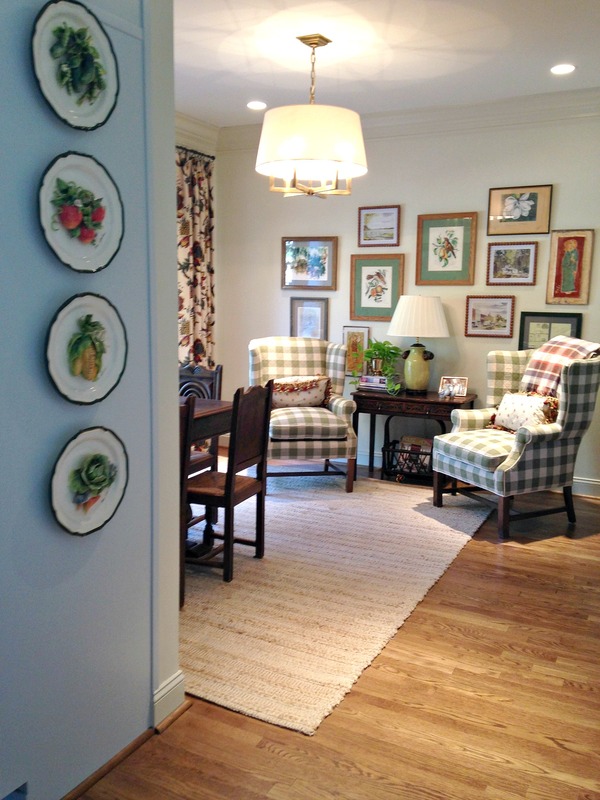 The buffalo check wing chairs and a great gallery wall with that pop of brighter green lamp! And from the stairs looking down . . . along with some snips from formal living room. I am showing random shots mixed together but I love how little pieces from different rooms weave together to tell the story of a house and more important the people who live in the home. I love how she framed this typewritten invitation to a BBQ and framed and leaned in the yellow section of her bookshelf, notice on the wider shot above the close up its on the shelf above the silhouette. This is one of my favorite things in her home…crazy huh? But true! I want to go to the 4-N-1 Club! By boat OR car! We might be adding a bit to mantle as well but not much. 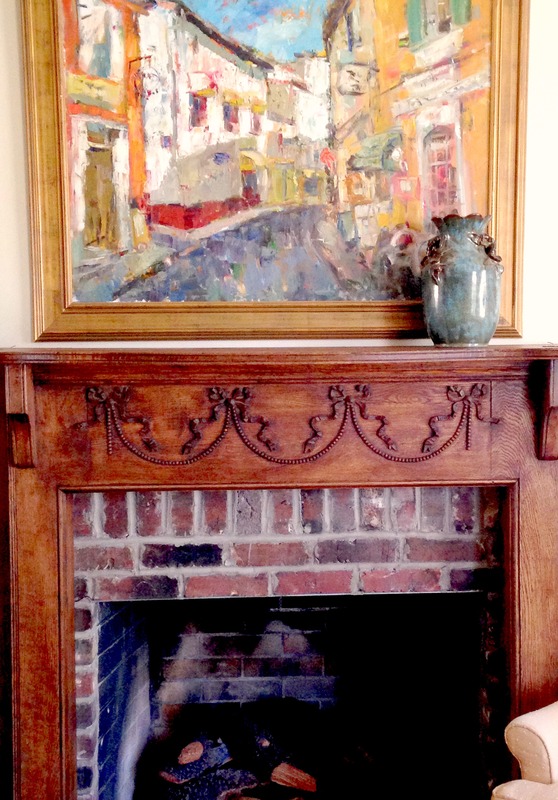 Down from the fireplace is a alcove, set back area and Ragan found the perfect antique for the spot. Adore this old English hutch with the majolica and again more little memories framed and tucked in here and there. That big piece is from Scott’s in Atlanta. Another old rug down the hall to bedrooms. 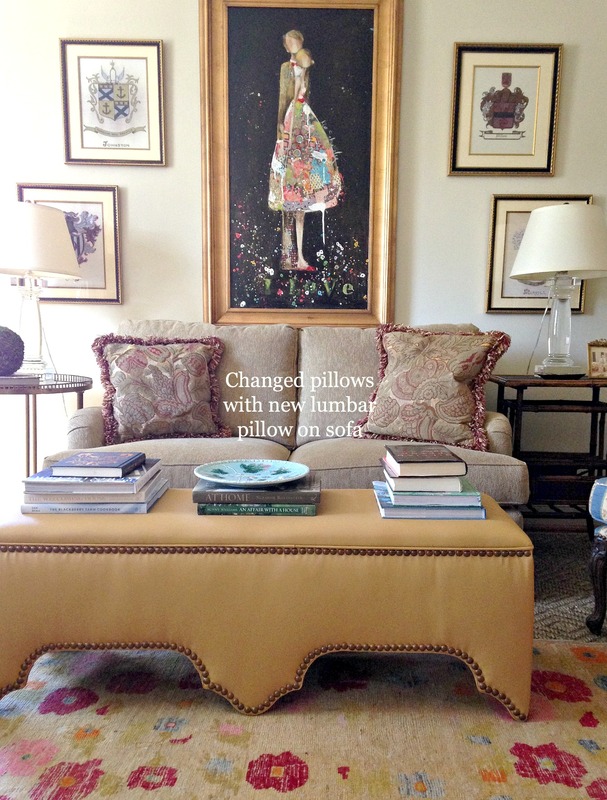 Below is just one small area we are tweaking, simply changing out pillows. So what am I doing in this house? Why was I even there. Well Ragan hired nearly a year ago to work on a small sitting room at the top of the stairs which I will show you next week. We have been emailing back and forth and decided to just get together in person to finally finish it off. Also just a few touches here and there like the pillow on the sofa above, recovering a chair here and there and some bathroom wallpaper…Just some random tweaking mainly! Now a wider view of this space. 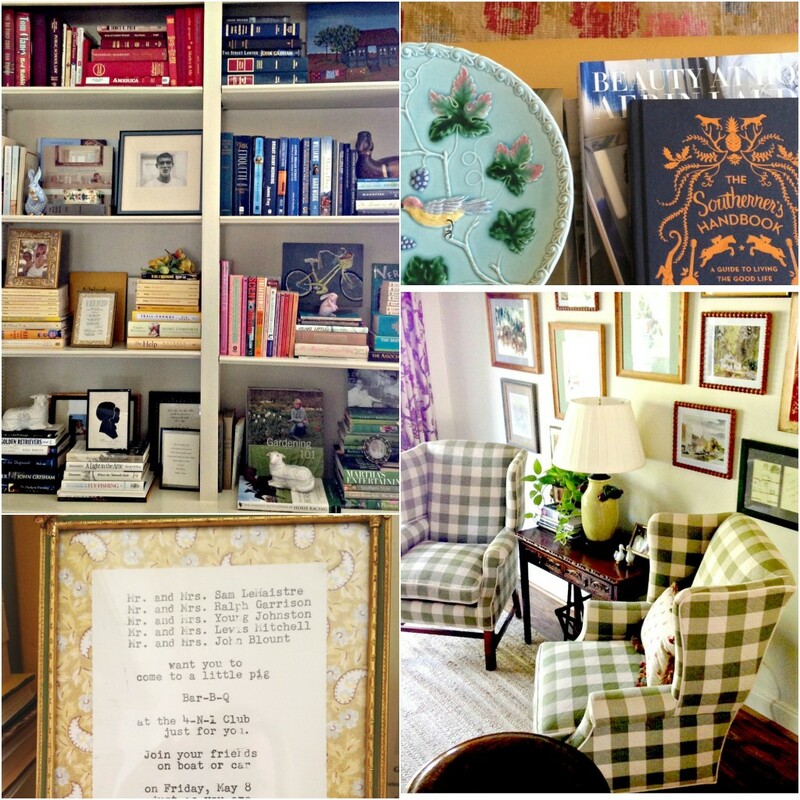 I love her bookcases and how she arranged books by subject and color and filled with little frames memories like this below . . . And I like that her books are actual books from her childhood and on up into adulthood as her interests changed. It’s a blending of things not just an attempt to decorate and go out buy books just because of their spine color. Their bookcases really tell a story of their lives and interests. 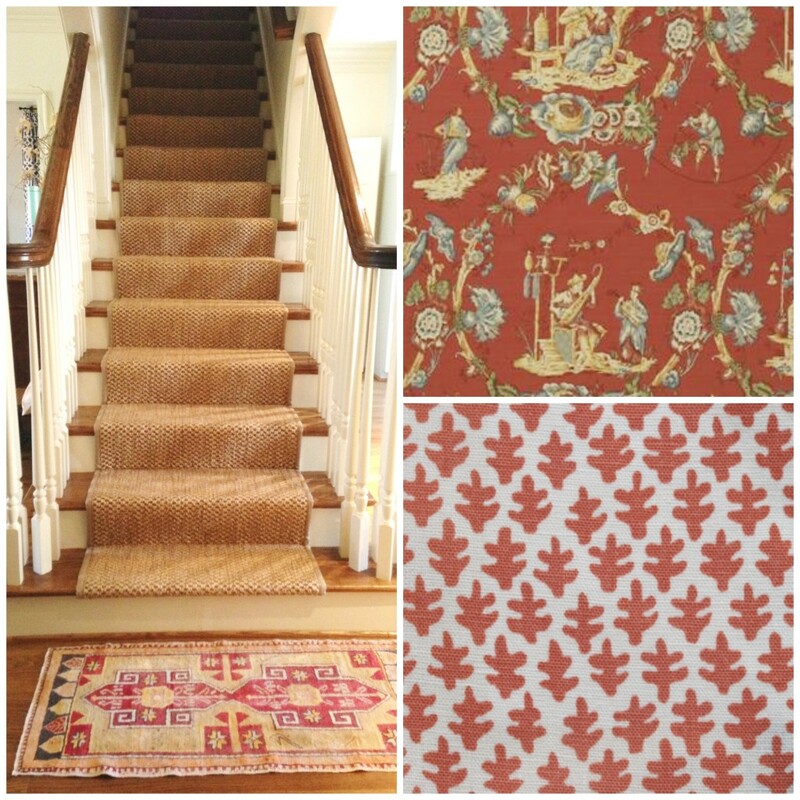 These are the prints and since the stairs are in this room they will flow so nicely I think . . .The top one is Cathay Toile by Marvic and I think its a bit brighter in person and then the small print is by Sister Parish Design. 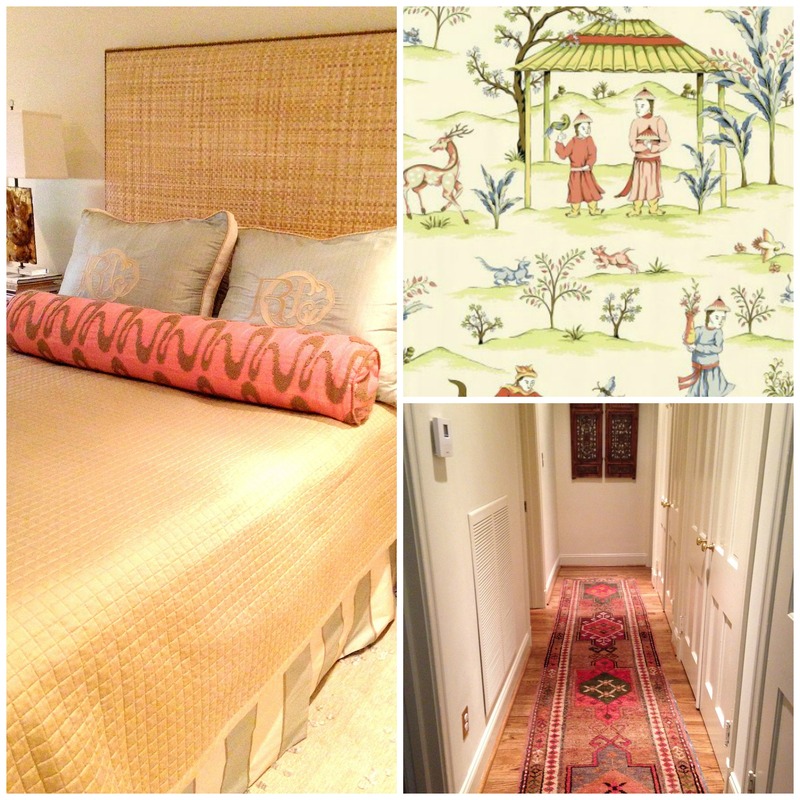 Back down the hall to the Master, the monograms on the bed I will have to tell you about later…by an amazing monogram designer in Birmingham. 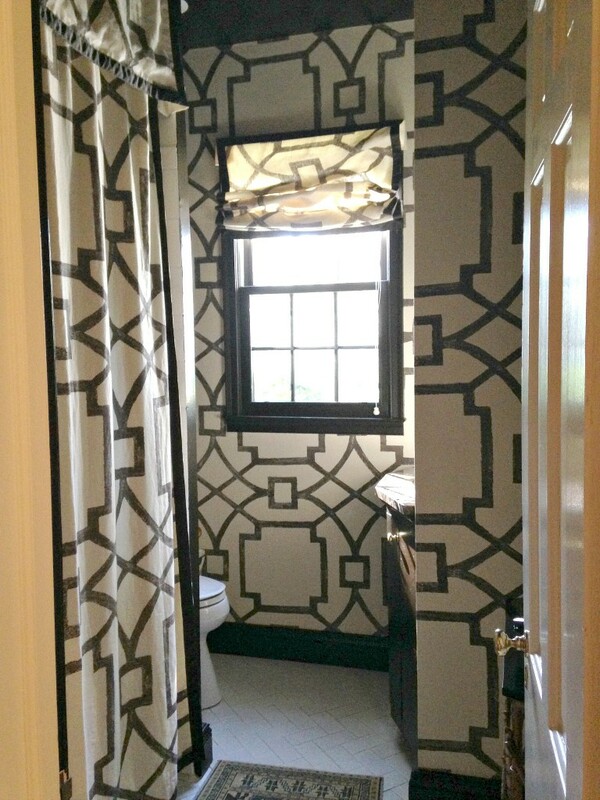 And we are adding the chinioserie wallpaper from Thibaut pictured below to the master bath…the colors are perfection. My phone camera did not do her bedding justice. I will have to get better shots of that one day! So do you want to see more upstairs and see more about the little space I am working on??? It’s going to be a bit funkier and less traditional but no worries, the upstairs bathroom will be swathed in more Thibaut chinoiserie! 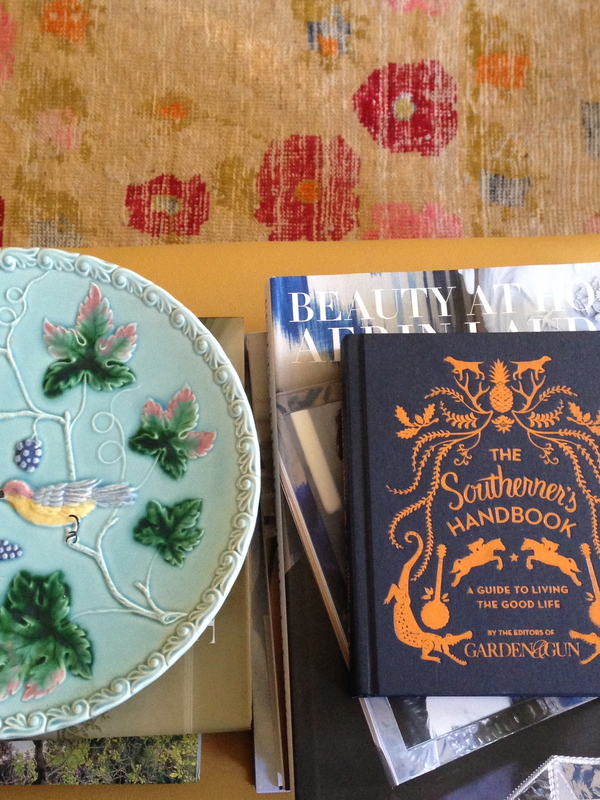 Check back soon and thank you to Ragan and Brad Cain for letting us step inside their Southern Living cover! Yes, of course we want to see more!! 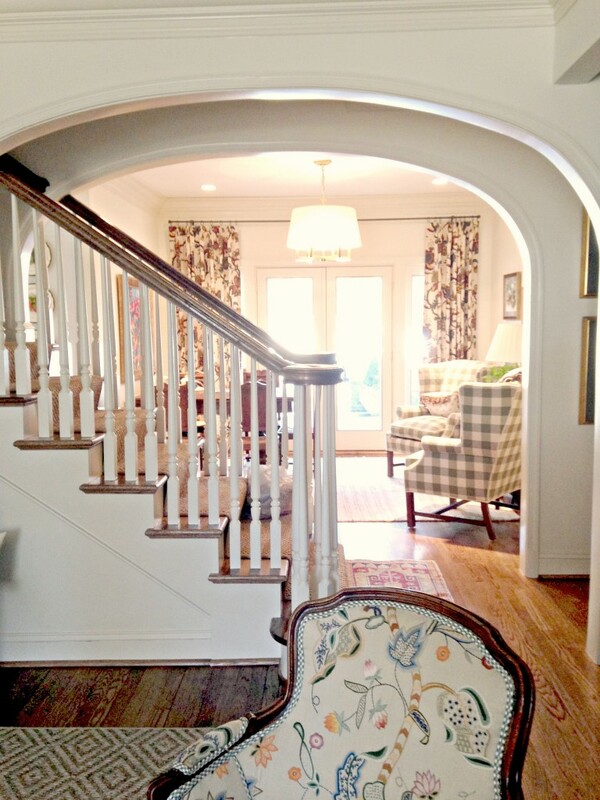 Her stairs make me want to add stairs to my house just to have that gorgeous runner! LOL Love it all…from the buffalo checks on the chairs, to the rugs, to all the COLOR, to the bookcases, to the precious little kitchen with the brass hardware. Thanks for sharing it all with us, Holly! Yes, please share more! Looking forward to the details on the monogram pillows. Beautiful! I love all the hardware too. 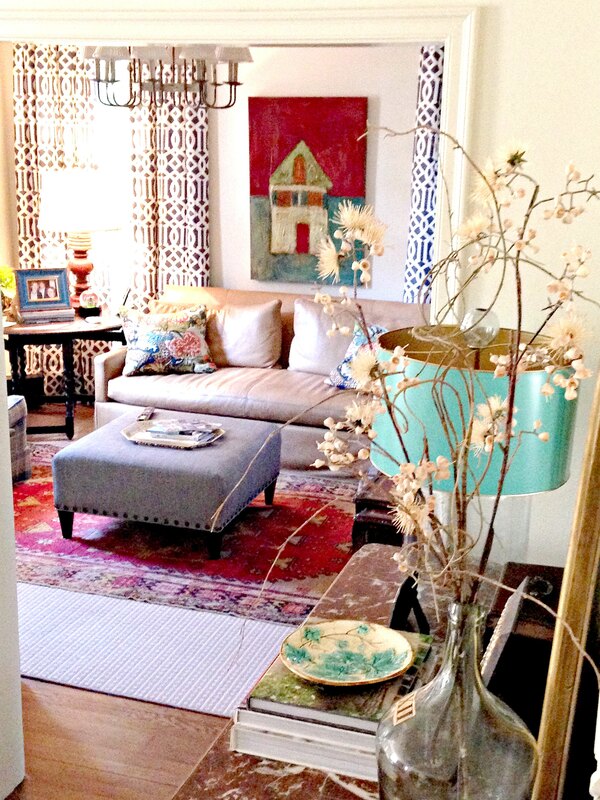 Ragan has done such a great job of making a traditional home youthful and fun! Can’t wait to see what else y’all do. I love all the color and pattern! The house is beautiful and inviting. Thank you for all the wonderful pictures. I can’t wait to see more. I really love this home. I am curious as to the age of the owners though. It looks collected over time and well-loved, much like I would like my home to be. Oh, Holly, I absolutely love this house. More, please!!! Your work speaks my language. WOW…. i am drooling! Your blog has been rocking my world! Awesome pictures. 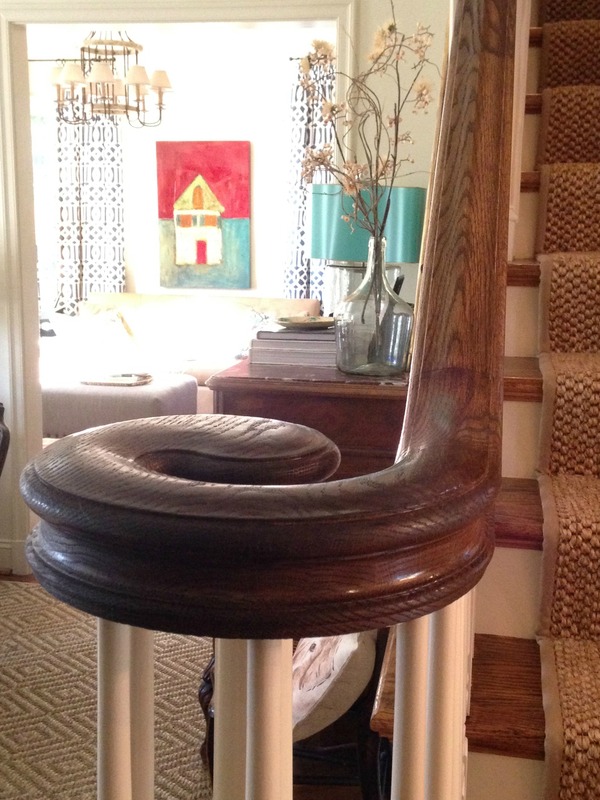 I love your creative mix of old and new and all the smart ways you put things together!!! Layers and Layers of beauty! So inspirational! Wow! Such an amazing blend. I love the classic feel, with hits of modern. And I can really appreciate how collected the space feels…I wouldn’t never guess they were a young couple, it looks like years of curating and collecting! Well done! This house is absolute PERFECTION! Love every single square inch! The trinkets in the bathroom look like Herend china! Holly, thank you so much for sharing this! Truly. This post oozes inspiration and has given me the push I needed to shop/source for some unfinished areas in my home. 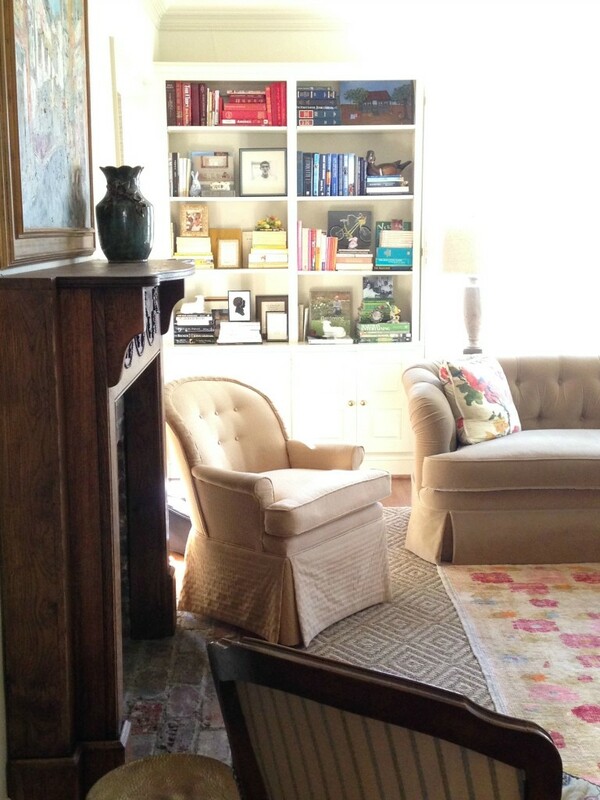 One question: In the room with the built-ins (and beautifully-styled bookshelves), do you happen to know the fabric on the throw pillows? The ones on the roll armed sofa in front of the built-ins? The fabric is so dreamy and graphic. I’d love to know what the fabric is, also. It’s fabulous — as is the whole house! So much to love about this charming house. Thanks for sharing. I can’t wait to see more! Insanely gorgeous! And your “tweaks” are spot on. This house is a home and so confidently radiates a sense of place. Wow. Just wow. What an absolutely beautiful home!! I keep coming back and studying each picture; this home is just so lovely. Looking forward to seeing more of the Cain’s gorgeous home! Gorgeous! I love all of the color! I have looked at at this page 100 times since you posted it! Please post more! What a dream house! We all know that a house like that doesn’t happen from a few trips to Home Goods. So lovely. Can you talk a little bit about the stainless steel backsplash? Who do you call to put that in? Would love to see more on that. LOVE everything about this house!! Those rugs!! Do you know where she bought her rugs from? The rug collection is out of this world! I also appreciate the fact the the kitchen wasn’t completely demolished and redone. I’m eagerly awaiting updates on this charming home! I love this house and am excited it’s from my hometown! 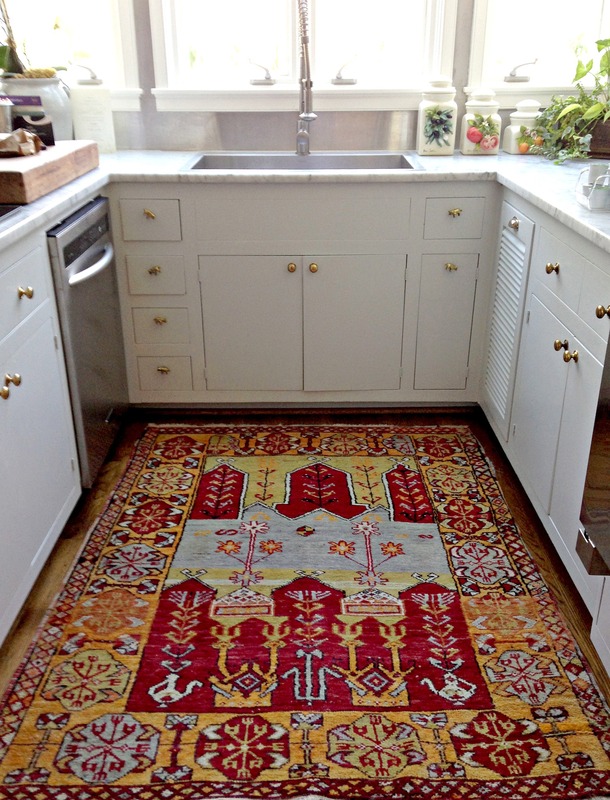 Will you please share info on those fabulous rugs (where to buy). I would also love to know the artist of the fantastic painting above the couch in the den. Can’t wait to see your final tweaks! You do amazing work!! 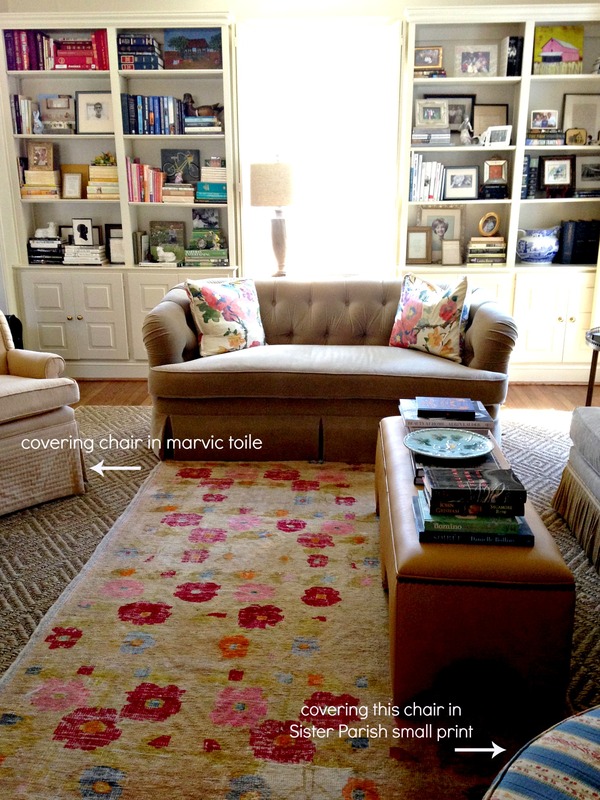 Love the eclectic mix of rugs – that is so my style. And the headboard!! Would love to know where that one came from. Am especially loving the “soul” feeling of this home . . . Personality galore. What a great project–what a special client–thrilled you can share it with us! 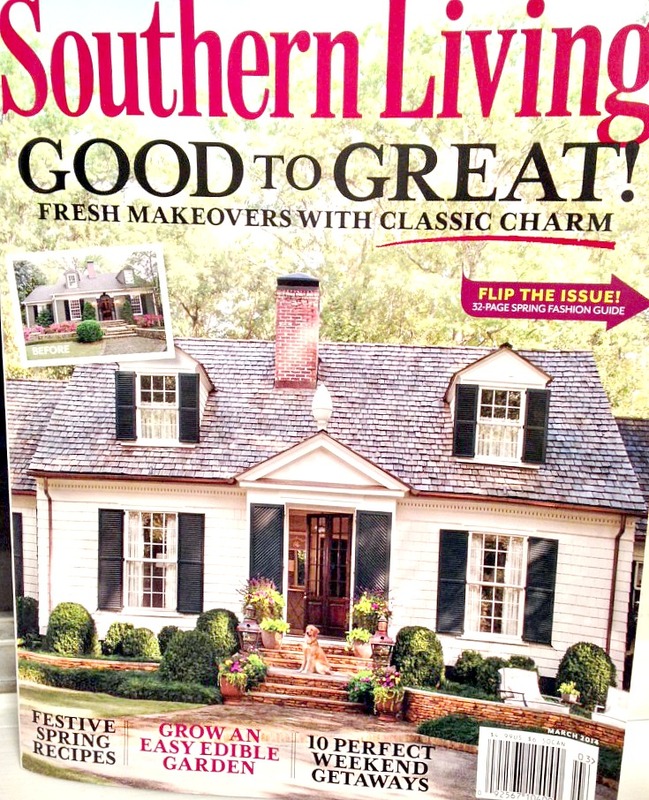 In the words of Rachel Zoe, “I die!” I swooned over the house on the cover when I received my copy of Southern Living. And to see the extraordinary way the your clients/owners have created such special, colorful spaces that hold such meaningful family memories is the icing on this delectable cake! So much is in my heart that relates to their design, but I can never seem to translate it to my home. And yes, please! More! I want to see if it all! Thank you so much for featuring J. Edwards Interiors in this blog post. We are honored that you love the designs as much as we do. Ragan and Brad are wonderful people to work with. If you need any of the specifics, we are happy to share resources or you may contact us at 205.870.5100. Beautiful home, very inviting! Especially love the picture collage! Did you ever do a post of the upstairs? This one is just wonderful – a real treat to get to peak inside! !